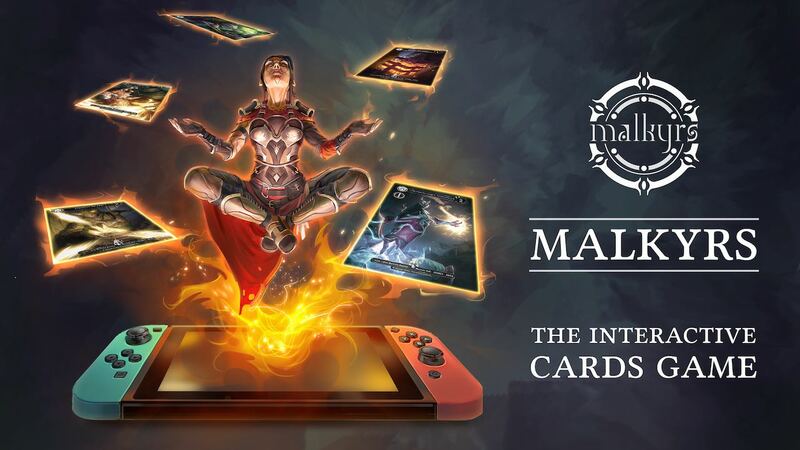 Malkyrs Studio has announced that Malkyrs: The Interactive Card Game will release on Nintendo Switch, a virtual trading card game with customisable physical cards that are brought to life through NFC and RFID technology. After they fall in battle, renowned fighters from across the legendary world of Heptia find that they have been resurrected on the island of Brënn. However, there is no escape, as an omnipotent goddess wants to see the warriors battle for all of eternity. It is only by ascending the ranks of these champions that they may win the chance to return to their past lives. The story-based campaign has branching paths and multiple endings, that, along with local or online tournaments, will let you choose from 12 champions and up to 10 action cards (out of 262 playable cards) to form a deck. These must then be scanned into the game to start. Your champion and action cards can earn experience and Favor, which can be used to upgrade them. Champions can earn item and ability upgrade slots that allow them to be customised, whereas powered up action cards have specialisations. This levelling is then stored in the card’s RFID, meaning that it can be traded with other players for them to use – even on other platforms, like PC and Mac. Malkyrs: The Interactive Card Game will release on the Nintendo eShop for Nintendo Switch worldwide in Q3 2019.